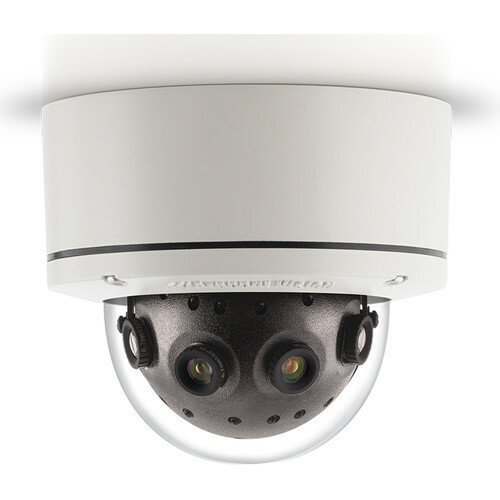 The SurroundVideo G5 Mini 12MP Outdoor 180° Panoramic Network Dome Camera from Arecont Vision features four 1/3" progressive scan sensors and four 5.4mm fixed lenses to capture images at a maximum resolution of 8192 x 1536. Enclosed in an IP66- and IK10-rated housing, the camera is suitable for both indoor and outdoor applications. The camera offers +/-5° digital vertical alignment to locate each sensor position, allowing for easy image adjustment. In addition, the camera features the Pixel Binning mode for enhanced low-light performance.